In the 60s, Shimura studied certain algebraic curves as analogues of classical modular curves in order to construct class fields of totally real number fields. These curves were later coined "Shimura curves" and vastly generalized by Deligne. We will take a tour of the rich geometry and arithmetic of Shimura curves. Along the way, we may encounter tessellations of disks, quaternion algebras, abelian surfaces, elliptic curves with CM, Hurwitz curves ... and the answer to life, the universe and everything. This is a note I prepared for my first Trivial Notions talk at Harvard, Fall 2011. Our main sources are , , ,  and . Briefly speaking, Shimura curves are simply one-dimensional Shimura varieties. I have accomplished my trivial notion task because I have told you a trivial notion. But obviously it does not help much if you do not know what the term Shimura varieties means. It only takes 5 chapters in Milne's notes in order to define them — not too bad — but initially Shimura invented them really because they are natural analogues of classical modular curves. Let be the upper half plane. Then acts on by Mobius transformations. For each complex number , we can associate an elliptic curve . The endomorphism ring is given by , which is either or an order in some imaginary quadratic field . The latter case is rarer and is given the name complex multiplication (CM). Two such elliptic curves and are isomorphic if and only if lie in the same -orbit. Hence we have the following bijection. can be identified with the fundamental set The elliptic point and have nontrivial stabilizer of order 2 and 3, which correspond to elliptic curves with complex multiplication by and and automorphisms groups of order and . can be viewed as the Riemann sphere with the north pole missing. By adding the cusp , we get the compactification . The cusp has the moduli interpretation as degenerate elliptic curves — nodal cubic curves. Proposition 2 is the coarse moduli space of complex elliptic curves and is isomorphic to via the -invariant. parametrizes elliptic curves with a -cyclic subgroup. parametrizes elliptic curves with a point of order . parametrizes elliptic curves with a basis of the -torsion points with a fixed Weil pairing. Theorem 1 is an algebraic integer of degree , where is the class number of the imaginary quadratic field . The Hilbert class filed of can be obtained from by adjoining . The maximal abelian extension of can be obtained by adjoining and the -coordinates of torsion points of . Moreover, the action of on can be described explicitly. This main theorem of complex multiplication implies an interesting result discovered by Ramanujan: is an "almost integer" as has class number 1! One problem with is that its fundamental domain is not compact. As a consequence, every subgroup of commensurable with is not cocompact and we have to add cusps to obtain modular curves. Question Can we find a discrete subgroup of such that is cocompact? You have definitely seen many examples from the artwork of M. C. Escher. 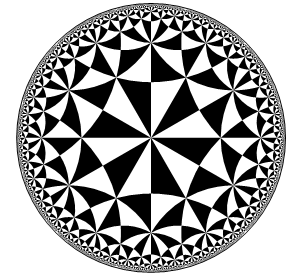 Using the Poincare disk model for , we can tessellate with infinitely many hyperbolic triangles with geodesic sides. Example 1 Let be the hyperbolic triangle with angles . Let be the rotation with respect to its vertex ( ). Then the group generated by acts on as automorphisms. Looking at the picture we obtain the representation It is called the -triangle group and has the fundamental domain consisting of and one copy of its reflection. Hence is a discrete cocompact subgroup of . More generally, any triple satisfying gives us a triangle group. It is a cocompact subgroup of and has exactly three elliptic points of orders . From this point view, is simply the limiting case , where and are the order 2 and 3 elliptic points and the cusp emerges as the limit vertex. Question Can we obtain cocompact subgroups arithmetically? Definition 1 Let be an algebraic group over . A subgroup of is called arithmetic if is commensurable with . Definition 2 A subgroup is called arithmetic if there exists an algebraic group over and a surjective homomorphism with compact kernel such that , where is an arithmetic subgroup of . Roughly speaking, after ignoring compact factors, an arithmetic subgroup of is simply a subgroup commensurable with provided . The congruence subgroups of are obtained by taking . But none of them are cocompact! In order get a cocompact arithmetic subgroup, we need to find some other algebraic group with . Instead of working with the matrix algebra and , we need some other -algebra structure. One example is given by the quaternion algebra. Definition 3 A quaternion algebra over is a central simple -algebra of dimension 4, namely a 4-dimensional -algebra with center and no nontrivial two-sided ideals. By Wedderburn's theorem, every central simple algebra is a matrix algebra over a central division -algebra. All the central division -algebra are classified by the Brauer group . Quaternion algebras are characterized from division -algebras as those having a quadratic splitting field. Example 3 For , we have the matrix algebra and the Hamilton quaternion . As , these are the only two! Moreover, the norm one elements in form and the norm one elements in form a compact group. Example 4 For a non-archimedean local field, one big result from local class field theory tells us that and quaternion algebras are classified by . Again there is a unique nonsplit quaternion algebra. Example 5 For a number field, one big result from global class field theory tells us that sits inside an exact sequence and quaternion algebras are classified by . So there are many quaternion algebras over , each of which is uniquely determined by an even number of nonsplit places. The discriminant of is product of all nonsplit places of . So for , any finite set of finite primes will give a unique rational quaternion algebra, which is split at if is even and nonsplit at if is odd. In particular, a quaternion algebras split at every place is just the usual matrix algebra . Now on let be a rational quaternion algebra split at . We can generalize the procedure of taking from by taking a maximal order (a -lattice of rank 4 which also a subring) and its norm 1 elements . Since , is an arithmetic subgroup of . As has no parabolic elements, we know that is cocompact. The resulting complex algebraic curve is the counterpart of the classical modular curve . Definition 4 is called a Shimura curve. We denoted it by to show the analogy to . Theorem 2 is the coarse moduli space of pairs , where is an abelian surface and is an embedding. In this case we say is a QM-surface (quaternionic multiplication). For a fixed choice of , a theorem of Milne implies that if there is an embedding , then there is a unique principal polarization of such that the corresponding Rosati involution on coincides with the positive involution on . Now assume is nonsplit and let be a QM-surface. If is simple, then its endomorphism algebra is an division algebra. acts on freely, so has dimension at most 4. But is QM, so has dimension at least 4 and . If is not simple, then . If are not isogenous, then which cannot contain the quaternion algebra . Hence and . Since is nonsplit, we know that , hence is an elliptic curve with CM by a field which splits . Proposition 3 If is a QM-surface. Then either is simple with or , where is an elliptic curve with CM by a field which splits . In the latter case, the corresponding point on the Shimura curve is called a CM point. Those are in some sense "degenerate" points on the moduli space of QM-surfaces. One can expect that these CM points could play an important role, since, unlike the modular curves case, we do not have truly degenerate cusps to work with. Due to the moduli interpretation, has a canonical model over . More generally, one can define the order by imposing a congruence condition . The resulting Shimura curve has a similar moduli interpretation as QM-surfaces with extra level- structures, which I do not quite bother writing down here. Theorem 3 (Shimura) Let be a totally imaginary extension of , which is isomorphic to a quadratic subfield of over . Then the Hilbert class field of is obtained from by adjoining for a regular fixed point of on . Whatever the word "regular fixed point" means, it can be viewed as an analogue of the value of in the modular curves case. Moreover, the action of can be described explicitly by the Shimura reciprocity law. We shall not go into the excessive details here. Question What is the answer to life, the universe and everything? Answer 42. It is calculated by an enormous supercomputer in Douglas Adams' The Hitchhiker's Guide to the Galaxy. 42 is important also because it is the perfect IMO score and many of you have achieved it. In the mathematical context, you may have seen this magic number as a bound for the number of automorphisms of a complex algebraic curve . Theorem 4 (Hurwitz) If the genus , then . You know the proof if you went to Anand's class and listened carefully. Those curves with equality are called Hurwitz curves. Now let me show you how quaternion algebras and Shimura curves could help us in finding Hurwitz curves. Let us get started by finding a volume formula for the fundamental domain of . Suppose is the half fundamental domain consisting of elliptic points of orders and quadruples of sides which are glued together in a way you all know. By the Gauss-Bonnet formula where is the Gaussian curvature of , is the geodesic curvature of . In our case, , and . Therefore, In other words, we recover the Riemann-Hurwitz formula, A simple calculation shows that the fundamental domain has the minimal volume when , and , which corresponds to . Suppose is a normal subgroup, then we know acts on as automorphisms and . If furthermore has no elliptic points, then , hence and is indeed a Hurwitz curve! The remarkable thing is that is actually an arithmetic subgroup coming from a quaternion algebra. How can one possibly figure this out? The above volume formula is true for an arbitrary discrete subgroup . But since arithmetic subgroups are defined in an arithmetic way, so one could expect that the arithmetic properties of quaternion algebras would benefit us. This is the case and here is an amazing volume formula worked out by Shimizu  using only arithmetic properties. Theorem 5 (Shimizu) Let be a totally real number field of degree . Then where is the discriminant of , is the discriminant of and is the Dedekind zeta function of . Given a quaternion algebra, we can work out the volume of with Shimizu's formula in hand (and the zeta function is going to take over the world). Hence we can possibly solve and using the general volume formula. In fact, can also be determined by investigating arithmetics by the work of Eichler. So one can sit down and work hard with quaternion algebras with a hope of finding triangle groups, i.e. those with and . The complete list of arithmetic triangle groups are determined by Takeuchi , . Example 7 The triangle group can be identified the group for the cubic totally real field and the quaternion algebras over only nonsplit at two real places. As discussed above, any normal subgroup of gives us a Hurwitz curve if it has no elliptic points. It turns out that the congruence subgroup has no elliptic points for any ideal of , hence gives sn infinite family of Hurwitz curves! Even better, the number of automorphisms can be computed as where if and otherwise. The first few with small values of genus are listed as follows. For the ramified prime over 7, . So , and .. It is known as the Klein quartic with the model . For the inert prime over 2, . So , and . It is known as the Fricke-Macbeath curve. For the three unramified primes over 13, . So we have three curves with , and . These were unkown before Shimura and are called the first Hurwitz triplet. The above five are actually the first five smallest genus Hurwitz curves. The next one is of genus 17, which is non-arithmetic. The next arithmetic one is of genus 118 given by the inert prime above 3. Clark, P.L., Rational points on Atkin-Lehner quotients of Shimura curves, Harvard University Cambridge, Massachusetts, 2003. Shimura, G., Construction of class fields and zeta functions of algebraic curves, The Annals of Mathematics 85 (1967), no.1, 58--159. Voight, J., Shimura curve computations, Arithmetic geometry 8 (2006), 103--113. Elkies, N., Shimura curve computations, Algorithmic number theory (1998), 1--47. Elkies, N.D., The Klein quartic in number theory, The Eightfold Way, edited by S. Lévy (1999), 51--102. Shimizu, H., On zeta functions of quaternion algebras, The Annals of Mathematics 81 (1965), no.1, 166--193. Takeuchi, Kisao, Commensurability classes of arithmetic triangle groups, J. Fac. Sci. Univ. Tokyo Sect. IA Math. 24 (1977), no.1, 201--212. Takeuchi, Kisao, Arithmetic triangle groups, J. Math. Soc. Japan 29 (1977), no.1, 91--106.